And I watched dumbfounded as she showed me how I could see in real time, what people are Twittering about. For example, if you’re kind of sneaky and wonder what people are saying about a competitor or gossiping about you (or your kids), Twitterfall might just tell you. Or … say you want to know why traffic is backed up on your work commute … or how exactly others feel about this sudden Vampire craze in pop culture. Here’s the tool to tell you — Twitterfall. An easy-to-use site, Twitterfall is the most efficient tool we’ve found for keeping up-to-date on the latest trending topics out there — the ones you care about, that is. This site lets you put in keywords of your choosing and will continuously follow tweets on the subjects you specify. No secrets anymore! Here’s how it works:1. Go to www.twitterfall.com. 2. 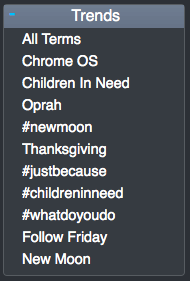 The first item in the left column is “Trends” click any of these to see people’s latest Tweets on the subject. Notice the tweets in the middle of the page that are beginning to fall on top of each other? Good. You’re getting the hang of it. 3. Now, it’s time to personalize. Type in any word you wish to search for in the Twittersphere. For example, can’t log into your Gmail? Type “Gmail” into the search area and click add. This is the second item in the left column. 4. 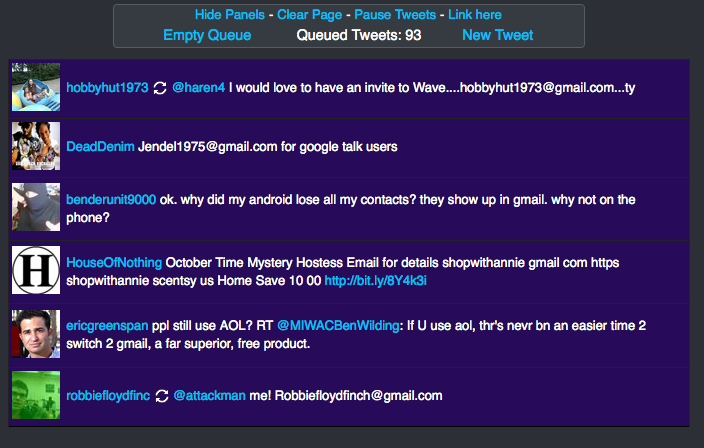 Now you should see tweets (framed in a new color) appear in the middle column. The color indicates which tweet corresponds with which search item (and also appears next to the keyword under “Searches”). We told you it was easy. 5. Further personalize the page by changing the Settings located in the right column. If you’re not so much interested in what exactly people are saying as opposed to how many are saying it, set your speed to “Fastest” and the tweets will fall on top of one another at a faster rate. You can slow it down as well. This is the first item in the right column. 6. 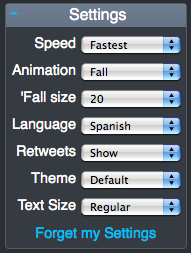 Other options under Settings allow you to change the animation of the middle column (gives you the option to have Tweets fade in and not fall), the Fall size (how many tweets are listed on the page at a time), and more. 7. You can also further specify your tweets by setting your Geolocation of where your tweets are coming from. This is the third item in the left column. 8. Is something popping up that’s not exactly what you were searching for? Eliminate those tweets by adding them to your Exclusions. This is the fourth item in the left column. 9. Plus! Log into your Twitter account from your Twitter page and you can keep up with those you follow at the same time. This is the last item in the left column. Visit the site and start experimenting. Trust us … you won’t be disappointed (but you may blame us for a new addiction). There are no tweets at all coming up when I go to Twitterfall. ‘wonder what I do wrong… Thans for any info. – Try adding a search to follow something you’re interested in. – Add a list to follow specific groups of people. – Type in an address into the geolocation panel to see what people are talking about in that area.